In the Matter of EPD Investment Co., No. 14-56478 (9th Cir. May 9, 2016) (Silverman, Graber, Dorsey) teaches that a core bankruptcy proceeding can take precedence over an arbitration agreement. The Trustee in a Chapter 7 bankruptcy filed an adversary proceeding against defendant Kirkland, an attorney who acted as counsel for EPD, claiming that Kirkland transferred assets from EPD, a purported Ponzi scheme, to a family trust named the “Bright Conscience Trust.” Kirkland moved the bankruptcy court to compel arbitration of the bankruptcy proceeding, and the bankruptcy court denied Kirkland’s motion. Kirkland appealed the bankruptcy court’s decision to the district court, the district court affirmed, and an appeal followed to the Ninth Circuit. 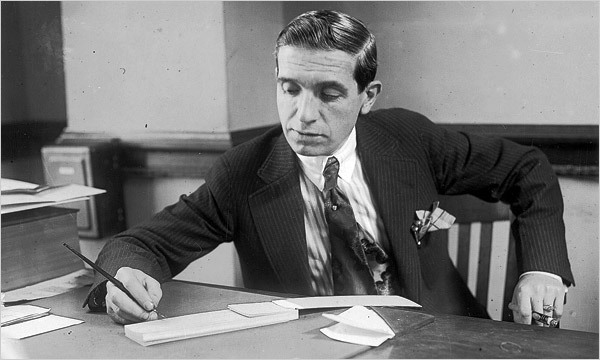 Above: Charles Ponzi in 1920 while still working as a businessman in his office in Boston. Wikipedia. The bankruptcy court has jurisdiction over “core proceedings”, the duties and issues reserved to the bankruptcy judge, tautologically speaking. In a core proceeding, “a bankruptcy court has discretion to decline to enforce an otherwise applicable arbitration provision only if arbitration would conflict with the underlying purposes of the Bankruptcy Code.” In re Thorpe Insulation Co., 671 F.3d 1011, 1021 (9th Cir. 2012). Here the Ninth Circuit panel agreed with the bankruptcy court “that the Trustee’s fraudulent conveyance, subordination, and disalowance causes of action were core proceedings, thereby giving the bankruptcy court discretion to weigh the competing bankruptcy and arbitration interests at stake.” The bankruptcy court applied Thorpe, and did not exceed its discretion by determining that the arbitration provisions conflicted with Bankruptcy Code purposes of centralizing resolution of the dispute and protecting parties from piecemeal litigation. The bankruptcy court had supervised debtors’ cases for nearly three years, during which time the Trustee filed more than 100 other adversary proceedings.